Are you considering a transition to Kubernetes? Or are you looking for help with your existing Kubernetes infrastructure? Kumina has designed, built and managed high-quality IT environments for over a decade and have already helped a wide variety of companies successfully adopt Kubernetes. We have a deep understanding of the struggles executives and developers face, and we know which technology and processes can make a difference. 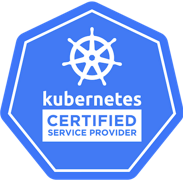 As Certified Kubernetes Service Partner, we can help you utilise the full potential of Kubernetes. Our team can assist you on-site and remotely, with quick consultations about specific issues or a more comprehensive support package. Kumina can provide expert guidance on designing and building a fully compliant Kubernetes infrastructure that meets your technical requirements and support your business goals. We will help you understand the implications and benefits of containers and microservices, show you how to avoid pitfalls and advise you how to fully use the power and efficiency of Kubernetes. A technology-stack assessment of your current Kubernetes infrastructure can identify areas of improvement and help you overcome issues. Our team is used to solving challenges around Kubernetes, has a keen eye for any problems that may arise, now and in the future, and can advise you how to prevent these problems. We are experienced users of the open source Jenkins automation server, and we can help you fully automate your software release and development pipeline, making your development process much more efficient. We can evaluate your existing tools and workflow and provide recommendations to better use your cluster. As trusted vendor of FinTech and SecApp companies, we pride ourselves on providing top-notch security for the Kubernetes clusters we manage. Our hosts comply with the CIS Distribution Independent Linux Benchmark and we apply best-practice common-sense security methodologies, like the principle of least privileges and in-depth security. Interested in challenging your online infrastructure with a pentest? Feel free! We would love to hear about your projects and find a time to discuss your challenges. Feel free to contact us and tell us about your challenge. The first hour of consulting, to determine how we can help you, is always free.